Guitar Blog: How to teach your 3 year old to play guitar. How to teach your 3 year old to play guitar. The number question I receive from parents is usually one of starting age. 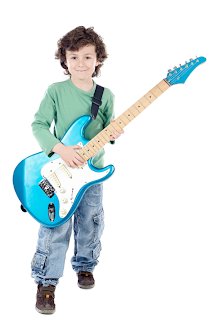 Many parents assume that their child can't start learning guitar until 6 or 7 years. The reality is children can start learning as soon as they are able to physically sit and hold a guitar. I actually recommend starting on a ukelele first because its small and easier for them to play. The best age I have found to start physical practice is between 3 and 4 years. When starting your child at a young age begin small and lower your adult expectations. Some parents get frustrated because they expect their child to sit perfectly still and do everything as instructed. Little kids want to move so sitting still for any length of time is unlikely. The trick is is to start small. For example spend the first few weeks just getting them in to a routine of sitting and holding their guitar (ukelele). Gradually introduce strumming and counting followed by picking and eventually putting their fingers on the frets. Once you achieve a routine try teaching them a song a simple song like 'Twinkle twinkle little star'. This may literally take months but thats okay because its about establishing a routine. 10 minutes a day now will expand to an hour a day in a few years and this will set them on a course for guitar mastery. Routine and fun are the only real goals in the early months. This is a hugely valuable lesson for children because it teaches them the power of small consistent steps. A concept that tends to get forgotten in our instant gratification world. This is not just about learning how to play guitar. Its as much about learning how to learn. The G4 Guitar Method is a structured method of learning how to play guitar. Its a unique system based on 27 years of research and experience that is based on a series of checklists. To view a video and learn more please visit our website at http://www.g4guitarmethod.com.